It came as a shock to me that off the 30 plus recipes in my drafts folder, there are only a handful of wheat based recipes. Almost everything centers around rice. That was quite an eye opener for me! 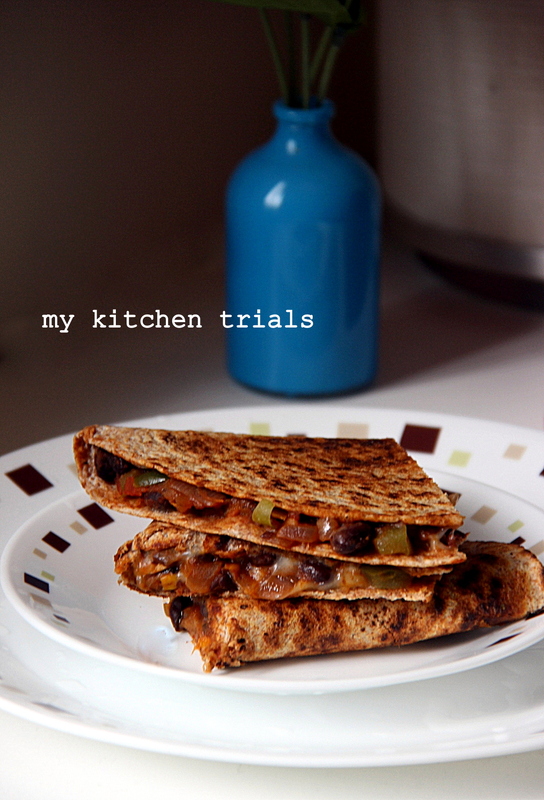 I needed to do some quick thinking as this week’s chosen theme for Blogging Marathon is wheat based dishes. Whenever I am in doubt, I just go to Vaishali’s blog. She makes everything look simple and I always find myself willing to try her tasty, but easy to make recipes. Today’s trip ended with me trying the recipe for Koki from her space. I would have loved to try the recipe that uses up leftover rice, but looks like I should reduce my rice fixation a bit. Oh..Who am I kidding? I will try it some other time :D.
Koki is a healthier version of paratha and has a shelf life of couple of a days making it ideal for travel food. 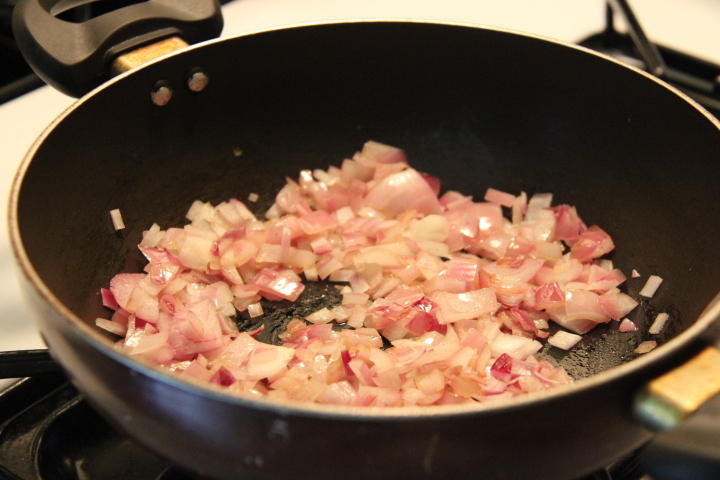 It can be made with onions and other masalas also, but that will impact the shelf life. The one here is a simple recipe with only black pepper in it for flavor. Add one cup wheat flour, 1 tablespoon ghee/oil, 1/2 teaspoon black pepper and salt as needed. Mix with hands until it comes to a sandy texture. Make a well in the middle and add water (it took a little less than half cup for me) in small batches. Keep kneading until you get a stiff dough. Divide it into four equal balls. Roll out the koki into thick chapati using a rolling pin. Use a little flour, if needed to prevent sticking. I didn’t need any. Score lightly with a knife in diamond pattern. Cook in a heated tawa. Smear some ghee and flip over to cook both sides until golden spots appear. Serve with yogurt. Add one cup wheat flour, 1 tablespoon ghee/oil, 1/2 teaspoon black pepper and salt as needed. Mix with hands until it comes to a sandy texture. Make a well in the middle and add water (it took a little less than half cup for me) in small batches. Keep kneading until you get a stiff dough. Divide it into four equal balls. Roll out the koki into thick chapati using a rolling pin. Use a little flour, if needed to prevent sticking. I didn’t need any. Score lightly with a knife in diamond pattern. Cook in a heated tawa. Smear some ghee and flip over to cook both sides until golden spots appear. Serve with yogurt. One of the most difficult questions in life is “What to pack for lunch tomorrow?”. Throw in a kid who is not a fan of Indian food and who hates rice in particular, the question becomes a lot more complicated. Having brought up on a diet of rice and veggies every single day, you are at a loss for what to pack. You find yourself using a good portion of your brain to answer the everyday riddle of “What’s for the grain? What’s for the veggie/fruit? and What’s for the snack? question. The answer came in the form of nutella sandwiches last year. But this year, to complicate matters more, the lunch box has to be nut free. So this is one of the options that I choose for the kid’s lunch. 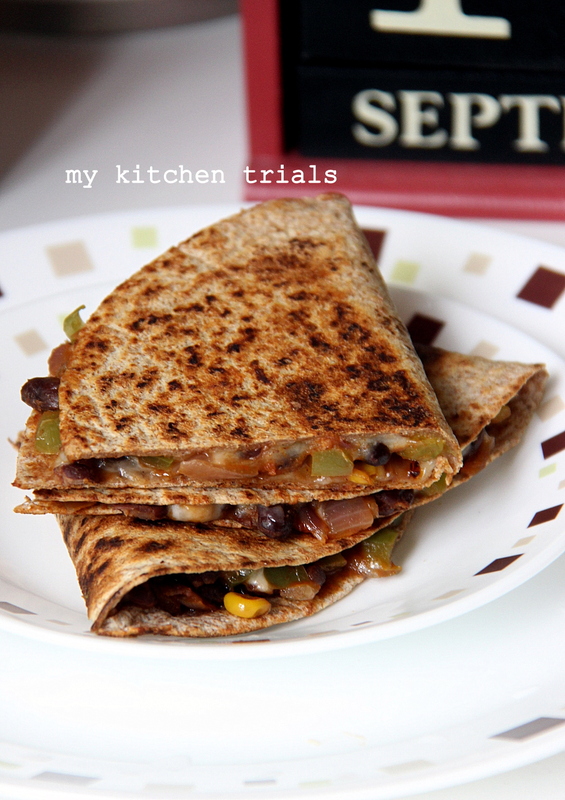 Loads of veggies, some cheese to hold everything together and a whole wheat wrap and you are done. I make the filling ahead and store it in the fridge. The filling is good for sandwiches as well. 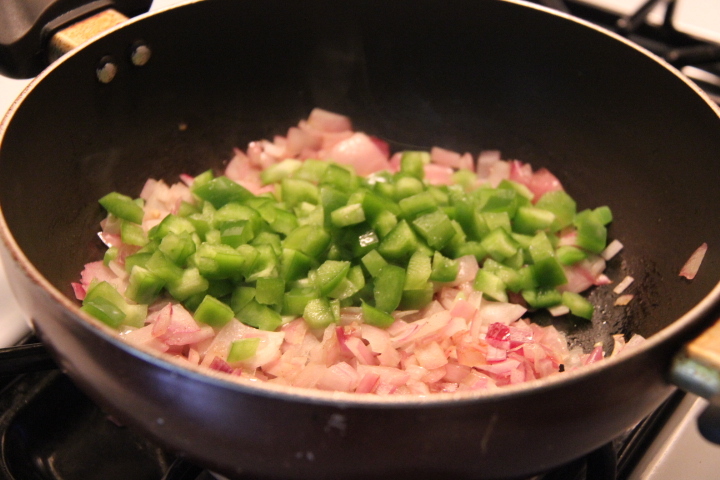 Heat one teaspoon in a pan and saute one chopped onion and 2 pods of chopped garlic. 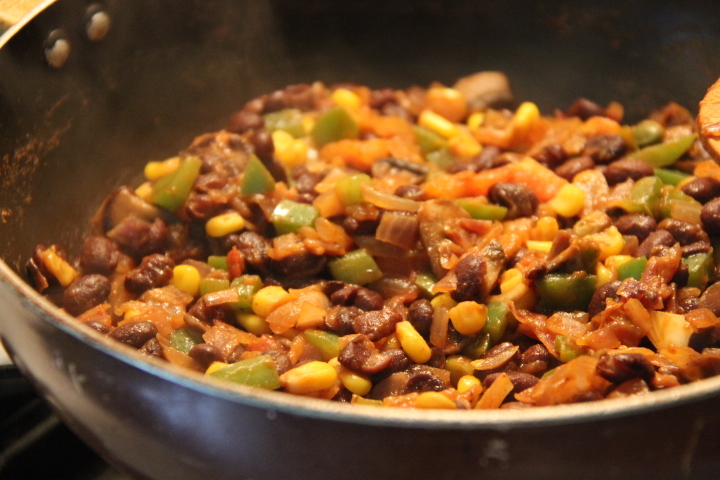 Add one small diced capsicum. Saute. 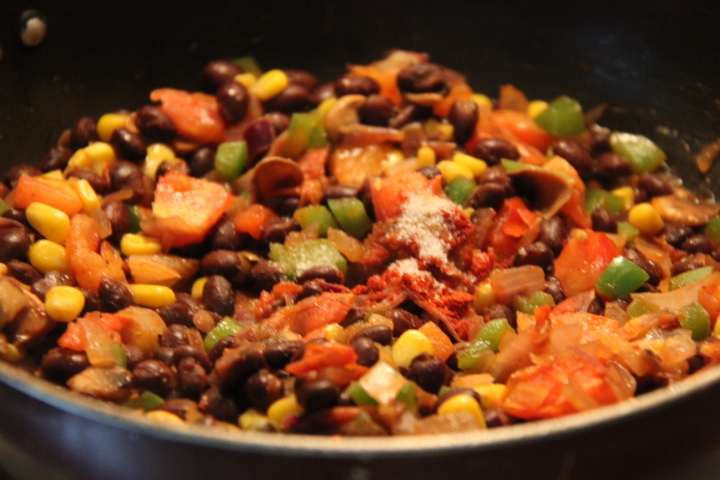 Add 1/2 cup frozen or fresh corn, one can of drained black beans and one big chopped tomato. I had about 1/3 cup of sautéed mushrooms, which I added to the mix. Add 1/2 teaspoon of chili powder (or per taste) and salt as needed. Mix well and set aside. This can be made ahead and refrigerated/ frozen as well. 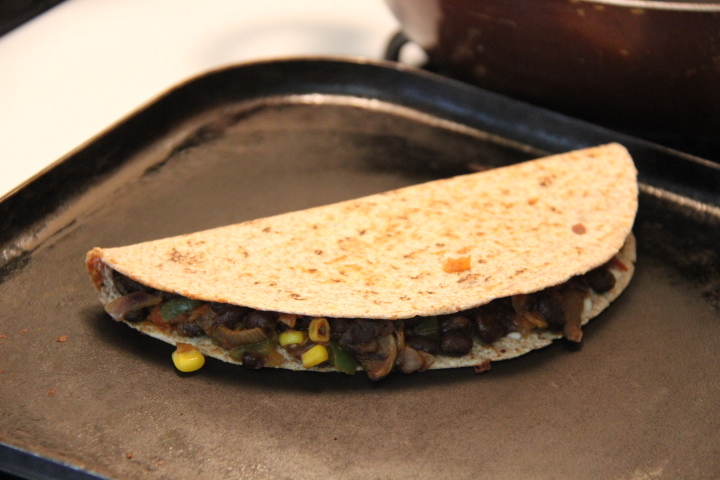 Heat a pan, add the whole wheat or plain tortilla. Once the tortilla is heated up, add 1-2 tablespoon of grated cheese all over. 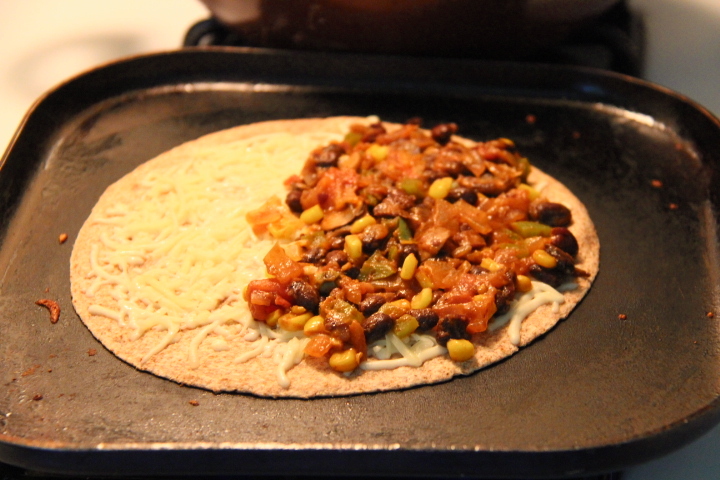 Once the cheese starts melting, add 2 tablespoon of the prepared filling on one half of the tortilla. Fold the tortilla over and cook both sides. Take off the heat, cut into 2 or 4 triangles using a pizza cutter. Pack as lunch or enjoy as dinner. Recipe makes : about 1.5 – 2 cups of filling. Add one small diced capsicum. Saute. 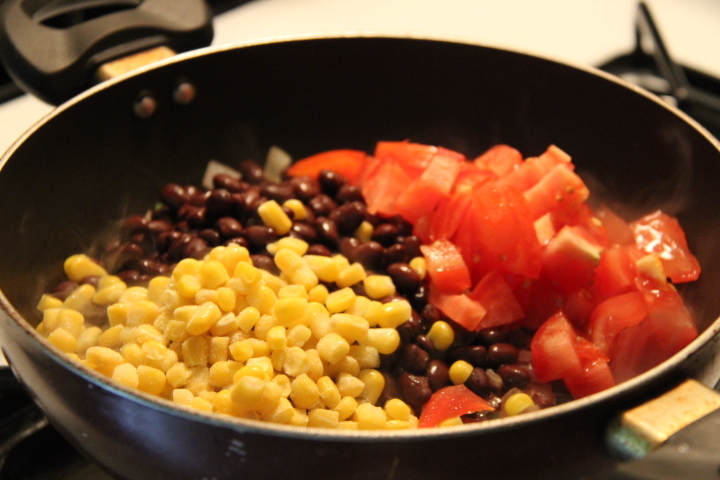 Add 1/2 cup frozen or fresh corn, one can of drained black beans and one big chopped tomato. I had about 1/3 cup of sautéed mushrooms, which I added to the mix. Add 1/2 teaspoon of chili powder (or per taste) and salt as needed. Mix well and set aside. This can be made ahead and refrigerated/ frozen as well. 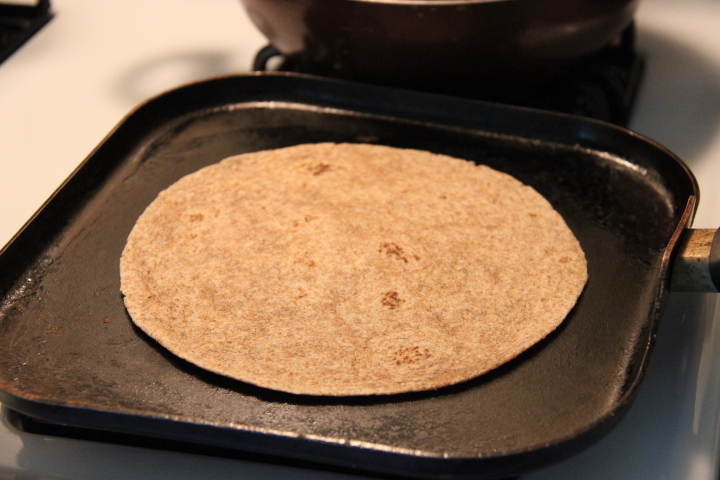 Heat a pan, add the whole wheat or plain tortilla. Once the tortilla is heated up, add 1-2 tablespoon of grated cheese all over. 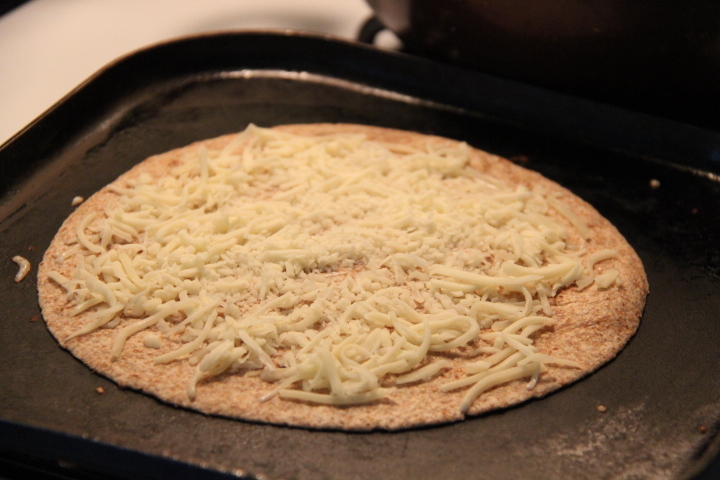 Once the cheese starts melting, add 2 tablespoon of the prepared filling on one half of the tortilla.